…I had never seen this before. Thank you, Z – that final image will be in my mind for years to come. …and you’ll get a cookie. Or something. See how well I procrastinate?!? Yup, it’s not just a zone…it’s a whole town. The Regginator puts his siggie where his mouth is! 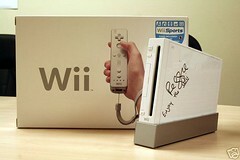 The Wii to the right is personally signed by Nintendo’s Reggie Fils Aime for the Penny Arcade Child’s Play charity. The current bid’s hovering at just over a grand. All proceeds go to an amazingly good cause! 5 days left to bid – any flush fans wanna get their game on??? State of the Union ‘speech’ is tonight! Tom Cruise deemed the new Christ! Some weekend tastiness while the proverbial candle burns, burns, BURNS. Mulder’s cross-dressing FBI gig from Season 2 of Twin Peaks. You are currently browsing the Broken Saints Blog-a-Plenty blog archives for January, 2007.